Every time I log onto Pinterest, I see that cute little blonde in her cute little outfits from Impressions Boutique in Arkansas and so I click over to their website. But I am leery, leery, leery of ordering clothes off the internet. Especially when you have 7 days to return them for credit, no refunds. But, right before Christmas, in the middle of “Do Not Spend Any Money On Yourself Right Now” December (anyone else celebrate that holiday? ), they put a bunch of their PIKO 1988 shirts on sale. Have you seen these? They look SO comfortable. I had been eyeing them for months, but again – so leery of ordering clothes online when I can't get a refund. But, the sale was enough to make me bite the bullet and so I ordered one. Well I LOVE it. It was tight in the arms at first (has since stretched out a little) but VERY roomy in the torso, which is kind of the point I guess. No one has asked me if I’m pregnant (Yet! Winning!) so I don’t think it’s TOO blousy, but it’s definitely blousy enough. For braver, shorter souls, it would look great with leggings. Is it Matthew's favorite shirt that I own? Not by a long shot. OH WELL. My advice if you order one: they are kind of thin, so I am not sure it would work for me in a lighter color. But the dark gray one I got is awesome. I will be watching their sales to order one in black and maybe burnt orange. 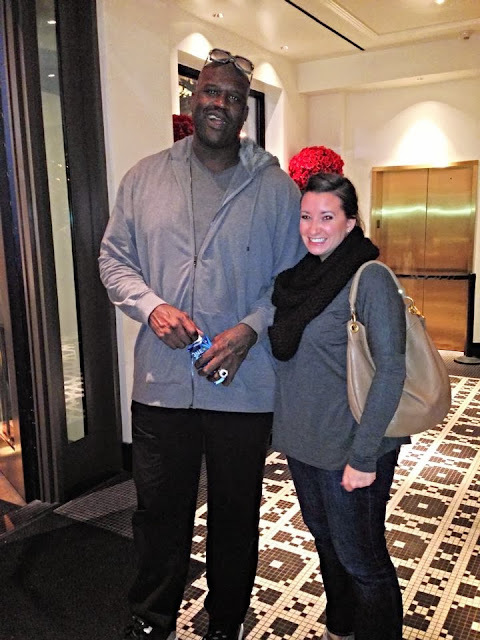 Oh look, here’s a super awkward picture of me* and my PIKO shirt with Shaquille O'Neal in Las Vegas! Does he look ridiculous or WHAT? Unfortunately Shaq was far too focused on M’s Auburn hat to notice anything else anyone else was wearing; otherwise, I'm sure he would have said "cool shirt!" *Please cut me some slack, I had been up since 5 am. Impressions in my city of Fayetteville?